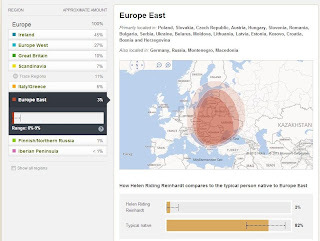 I have done autosomal DNA testing with Family Tree DNA, 23andMe and AncestryDNA. I have not done the National Genographic Geno 2.0 test. 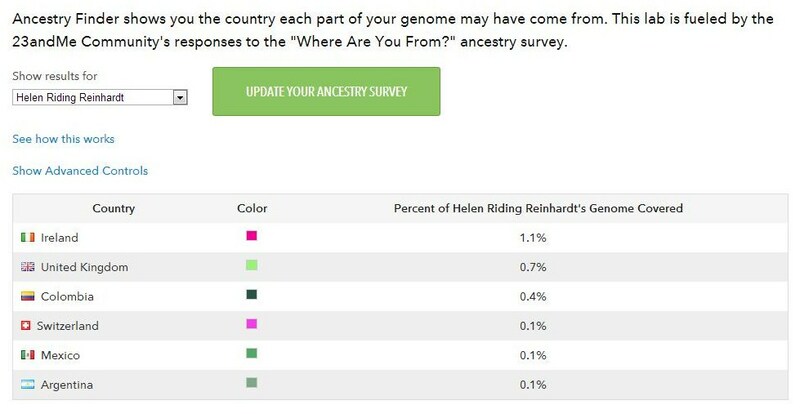 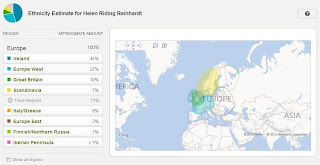 This is not meant to be a wordy blog post and I plan to update it if and when my known family tree ancestry and/or genetic admixture estimates improve. 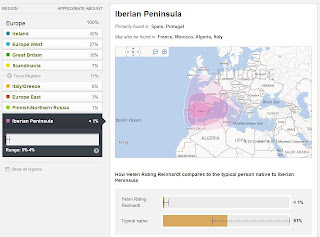 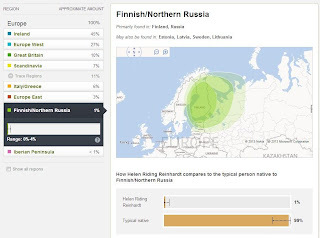 For now it is just a spot to park my latest autosomal admixture results for those who are familiar with the different genetic genealogy products and are interested in viewing my personal results. 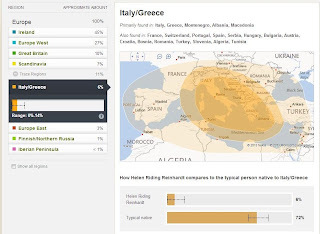 For an overview of the different products, see Kelly Wheaton's lesson on ancestral origins. 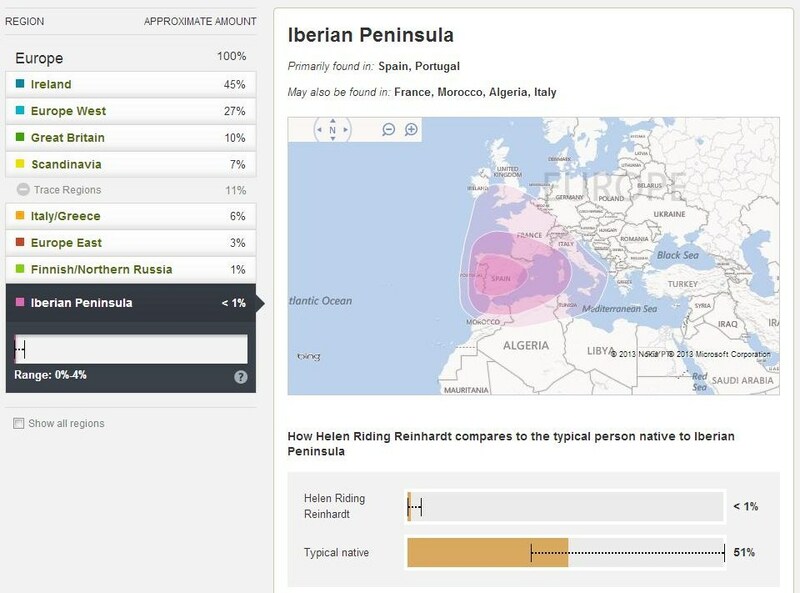 For more insight into the AncestryDNA ethnicity update launched in September 2013, please refer to expert blog posts by Blaine Bettinger, Judy Russell and Debbie Kennett. 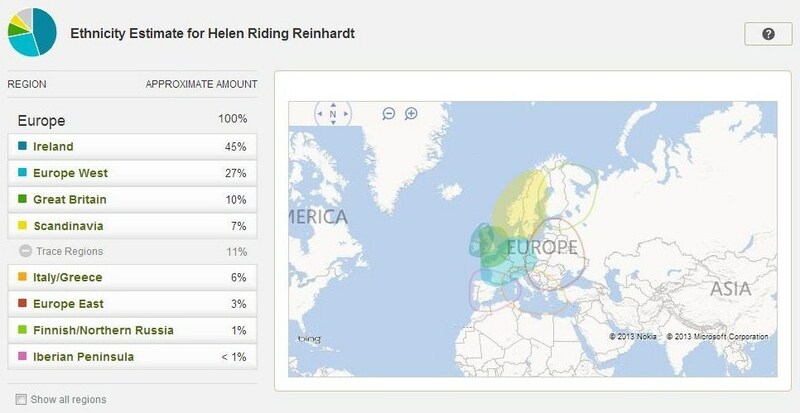 My known ancestry is European, to my knowledge all four grandparents were born in Europe. 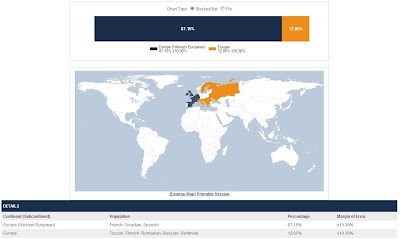 Below are my Family Tree DNA Population Finder results (click to enlarge image, reference populations listed are French, Orcadian, Spanish, Tuscan, Finnish, Romanian, Russian, Sardinian). 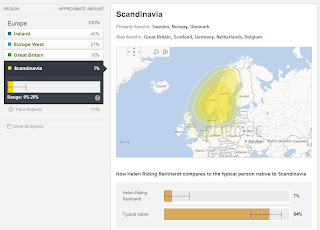 Below is a comparison of my 23andMe Ancestry Composition Standard Estimate (Map View) and Speculative Estimate (Chromosome View) and old and new AncestryDNA Genetic Ethnicity Estimate results (summarized simplistically in two geographical areas below, compared with my known ancestry). 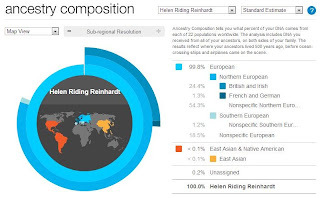 Click to enlarge images and rest your cursor on each image to view its description. 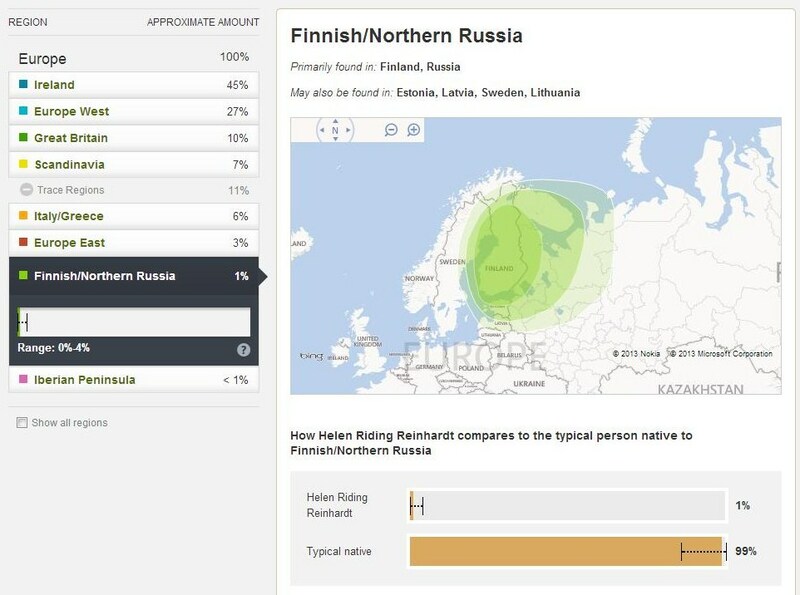 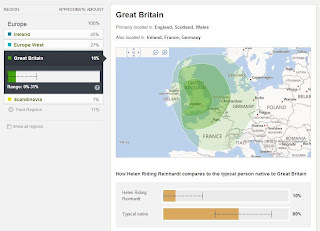 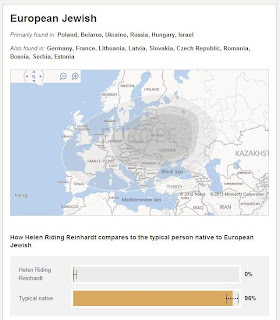 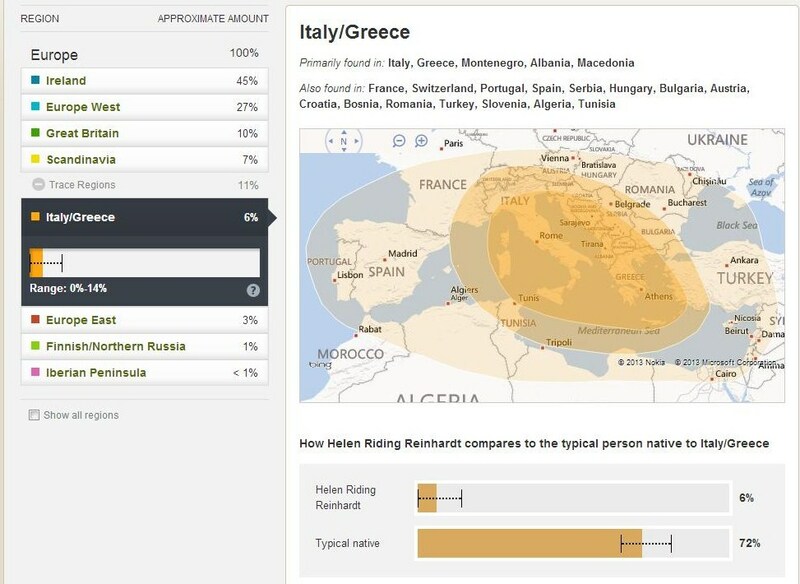 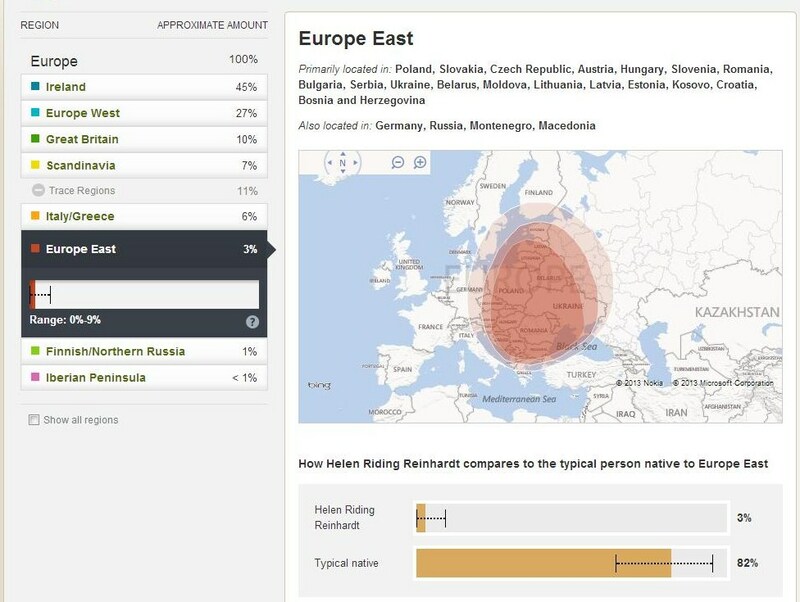 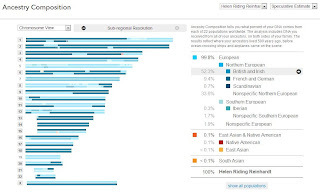 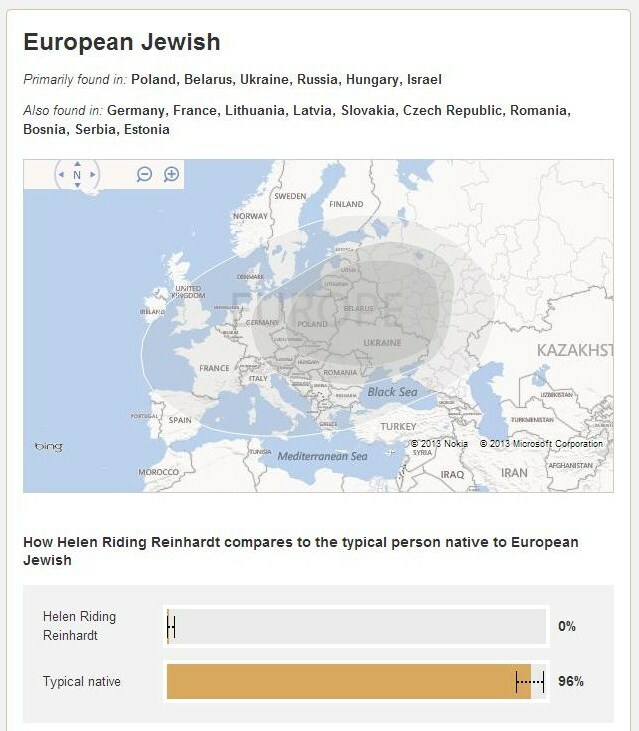 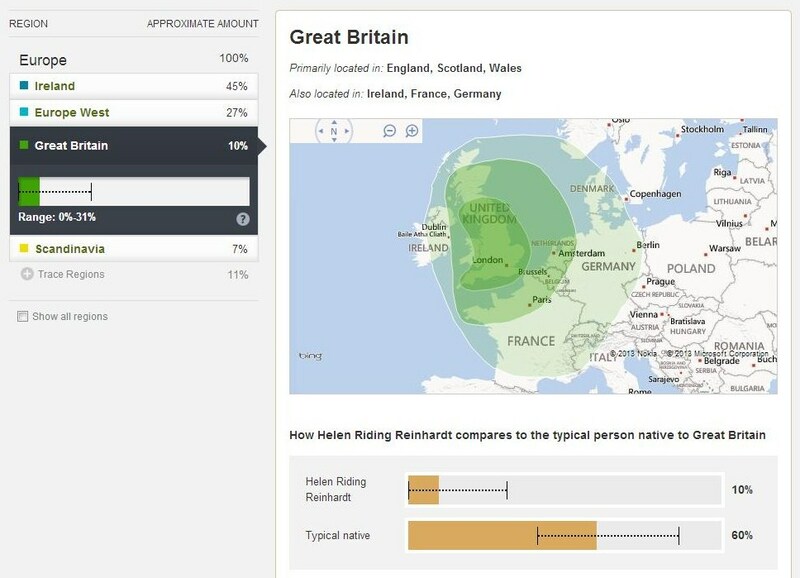 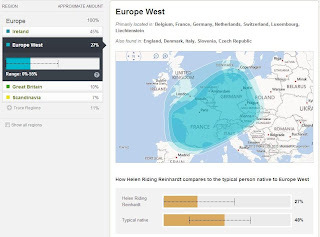 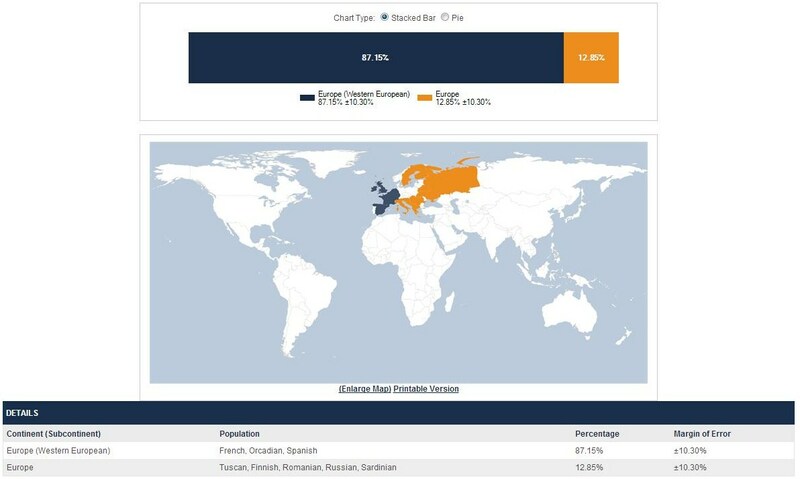 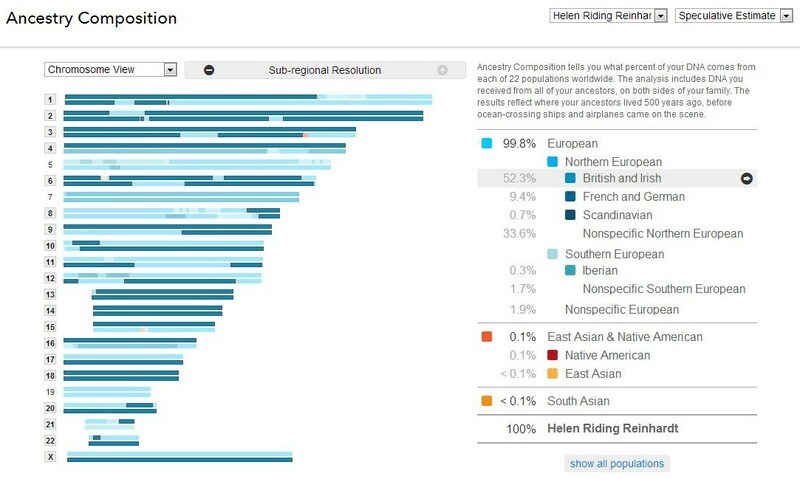 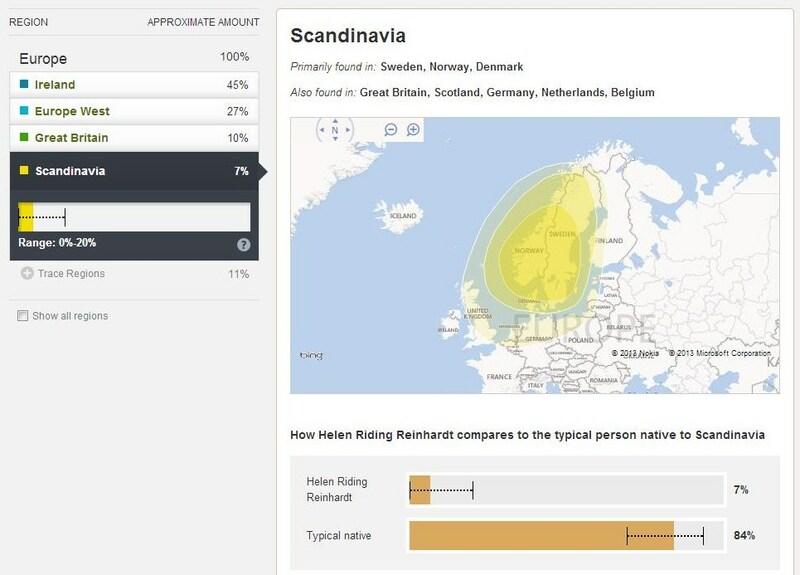 The only European region I don't have in the New AncestryDNA Genetic Ethnicity Estimate (mean estimate) is European Jewish – my range for this region is 0%–2%. 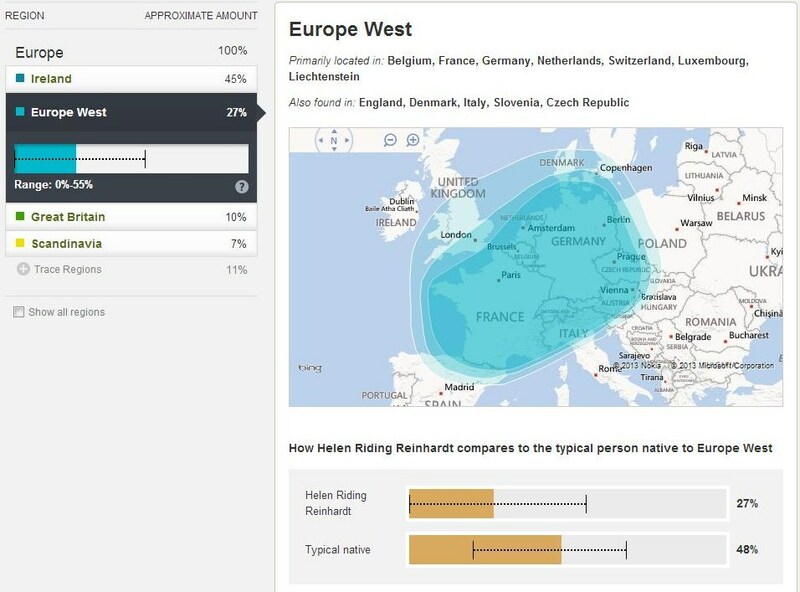 I have a 0%–0% range for all regions outside Europe. 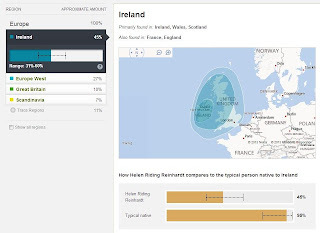 I have highlighted the British and Irish portions of my 23andMe Speculative Estimate in Chromosome View to illustrate the different origins of the X chromosome contributions from my mostly (75%) British Isles mother and my British Isles paternal grandmother. 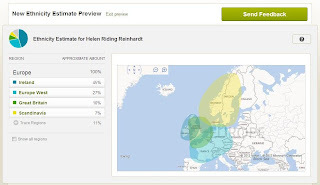 See also how my Ancestry Finder map view compares.